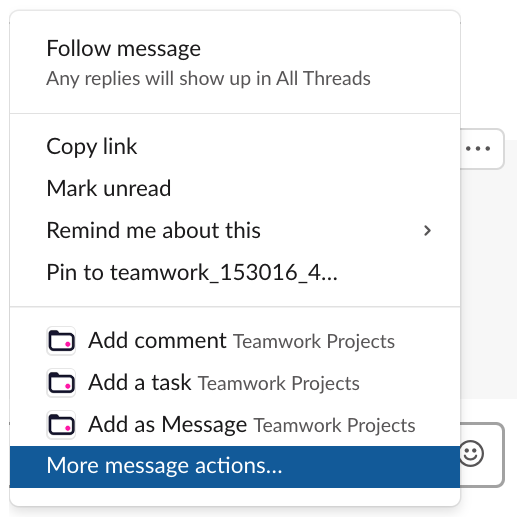 Within Teamwork Projects, if you have enabled the Slack integration, the settings for the integration can be updated within Slack itself. To access the integration settings, click the options (three dots) button to the right of a message in one of your Slack channels. If Settings isn't listed in the most recent actions, select More message actions. In the actions modal you will then see an option for Settings. Once you select the settings option, a message will appear in the conversation thread with a series of options. Click the Settings button to open the settings menu. 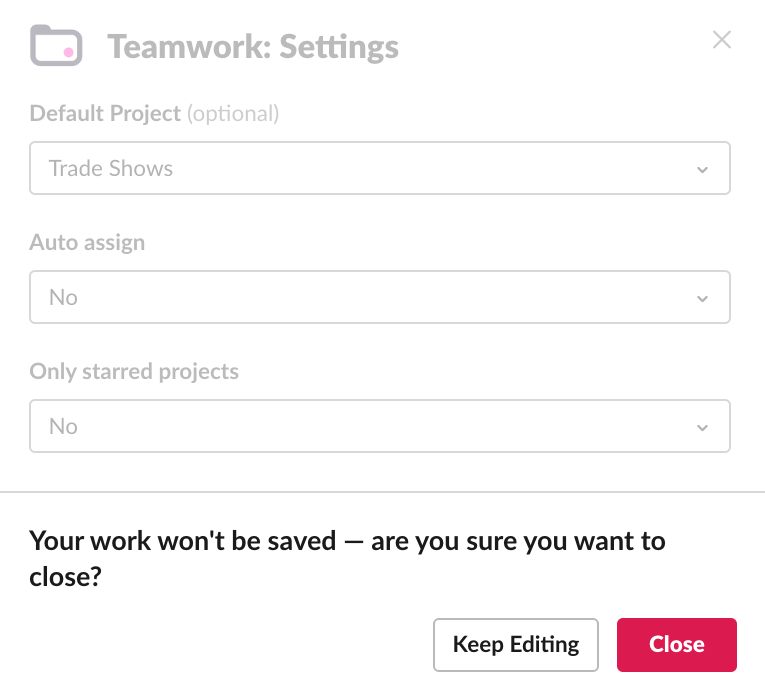 In the settings notification, you will also be able to log out of your Projects account. You may also see an option to switch to another Projects account, if you are already logged into multiple sites. Default Project - Choose a default project from your site to add items to. Auto assign - When a user from your Projects site is not mentioned in the task name to be assigned to it, auto assign the item to the user account creating the task. Only starred projects - Only display starred projects as options in the projects dropdown for adding items to. 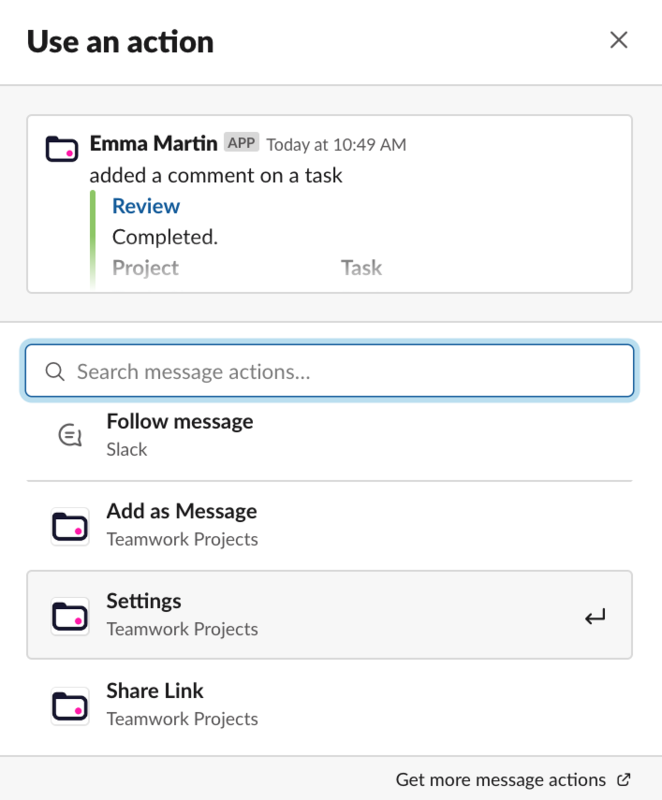 When adding a task - either fill the title or description first, with the content of the Slack message. When you click cancel or the X in the top right corner, you will be alerted that your changes will not be saved if you proceed.